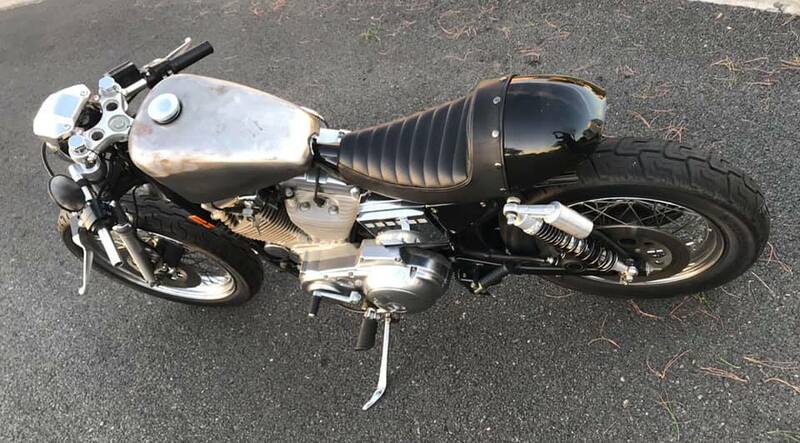 Well, I have had a stock 1993 Sporty in storage for about 10 years now and thought I had better make a start on this machine, it will be for sale when completed and thought I would make a little Caff bike out of it, its going to be a fun ride for someone for sure. Got it running now. 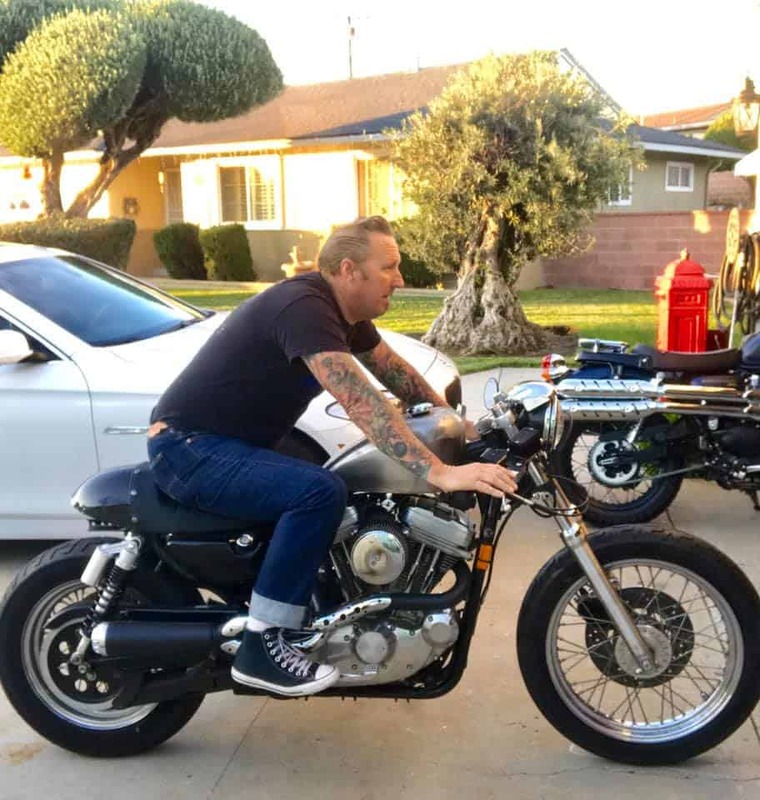 I have a RSD 2 into 1 Tracker exhaust on her with a Dyna jet kit and an Arlen Ness Air filter set up and she seems happy that way. 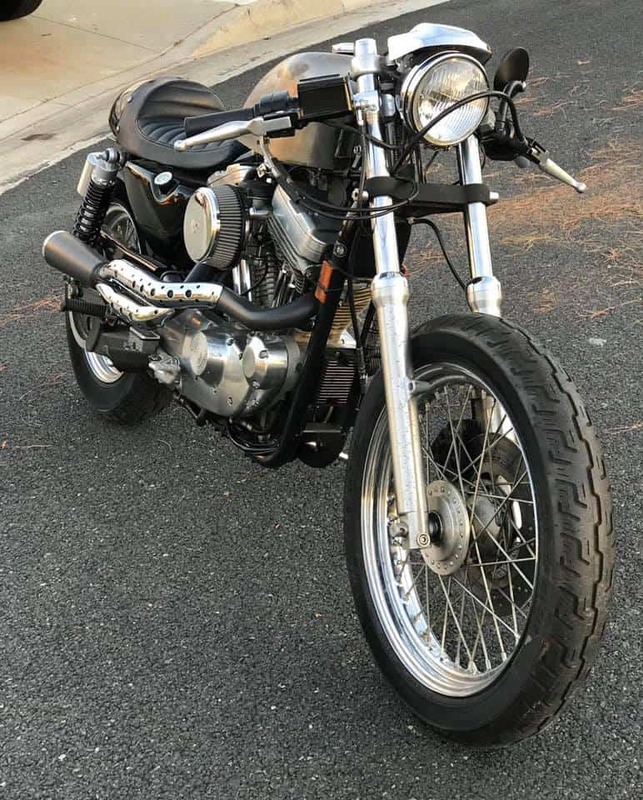 many people have told me I am wasting my time with a bike such as that as they are Cruiser type machines or simply Choppers, and I so disagree whole hardheartedly, they are fun bikes and affordable and have a lot of torque, so I have a ways to go but it really is looking pretty aggressive already and I am enjoying wrenching on this Sportster right now. 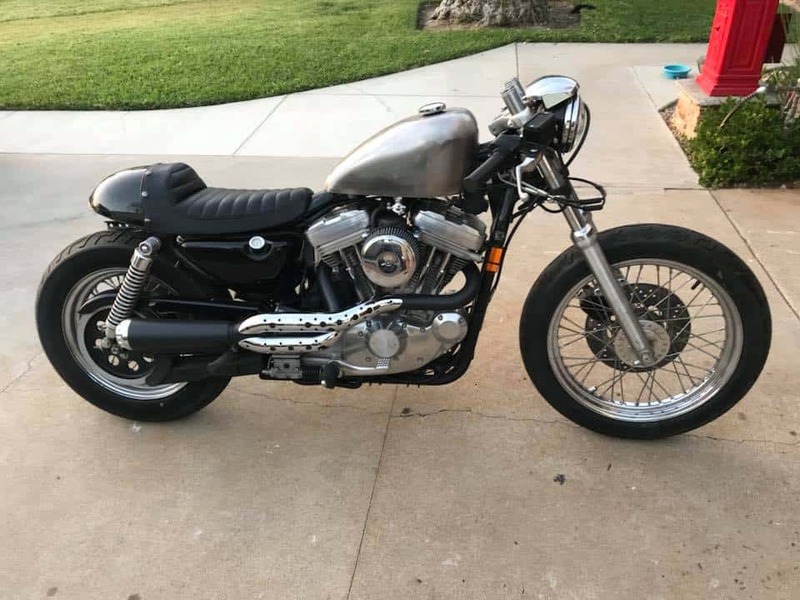 As you can see by the photos I have taken, the bike isnt a huge heavy machine, this is an 883 Sportster with a 5 speed and Torquey as hell, now, the trick to get the power out of these is sinply change the cams and the thing will be a rocket, so maybe later I shall go that route, but right now I wanted to change the styling and what I have done is fit a different bigger gas tank anddropped the fork tubes 50mm up through the tree’s just to lower the front end a bit. 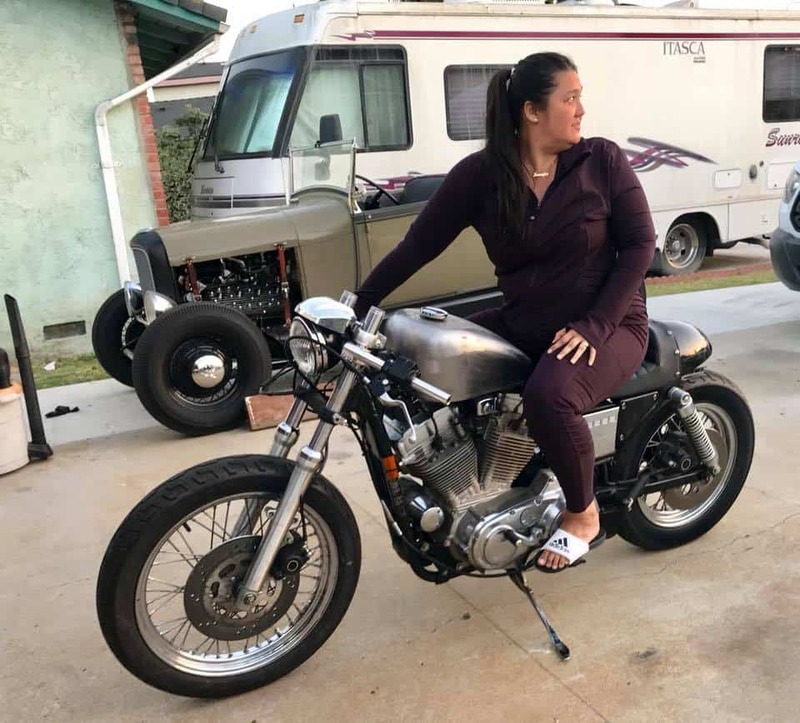 I shall be changing the foot pegs and painting the bike a little later, as I am not sure what design to come up with yet but I do have a few ideas of Candy Gold, Candy Flake Blue or a White with a stripe, but- until I get the bike to look how I want, the paint will be last of course. 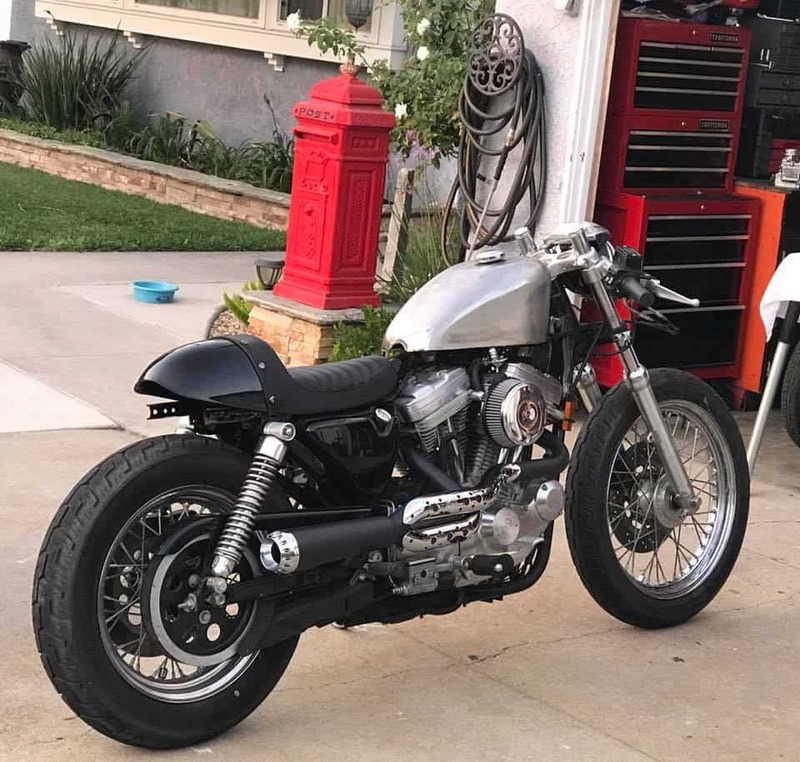 This is a belt drive and a lot quieter than a chain version, these are small bikes and was astonished to how little they are compared to the big twins. 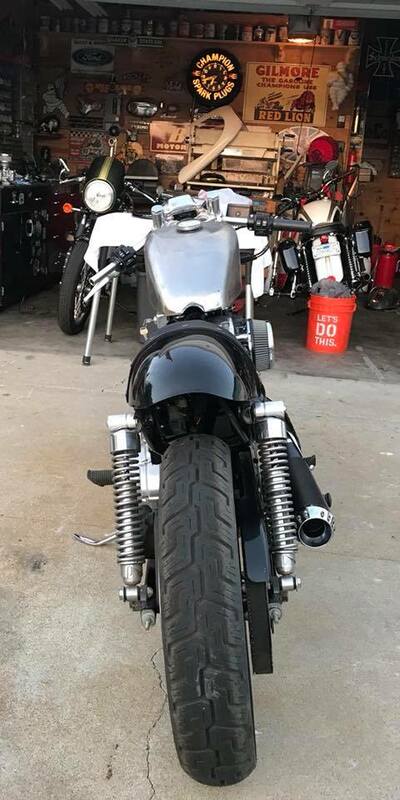 I am not sure what to do rear wise but thinking of frenching a tail light into the cowl, that way it keeps everything clean and the lines will flow well, the rear will be as uncluttered as the front of the bike, but will drill and chrome the chain guard next week to give that a more Sportier look. For now I shall stick with the Factory shocks, as I want this to be a fun, affordable motorcycle and who ever the new owner will be, they can easily change out shocks to give their twist to it, but plenty to do as I go along on this Caff bike project and now with the RSD 2 into 1 it sounds a lot more healthier and not too crazy loud where you will get pulled over all the time or be that annoying Motorcyclist thats letting car alarms go off as you ride by. 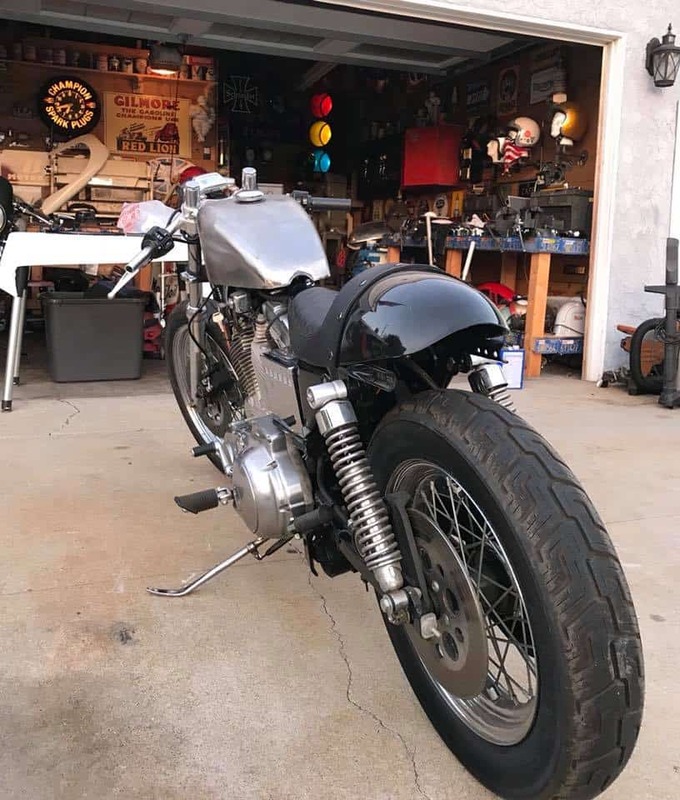 She sits way better now and am pleased with this look, I need to fit Grips to the Clip on’s and fit a speedometer and that will all come in time, right now I am in two minds on the stock head light or use a Custom bigger one about a 5-3/4 version with internal LED signals etc. I will remove passenger pegs and change pegs for maybe some mid controls but that all depends on budget right now. She has a New battery and fires right up, I have just removed the stock fender and am going to cut and shorten it and then put back on. 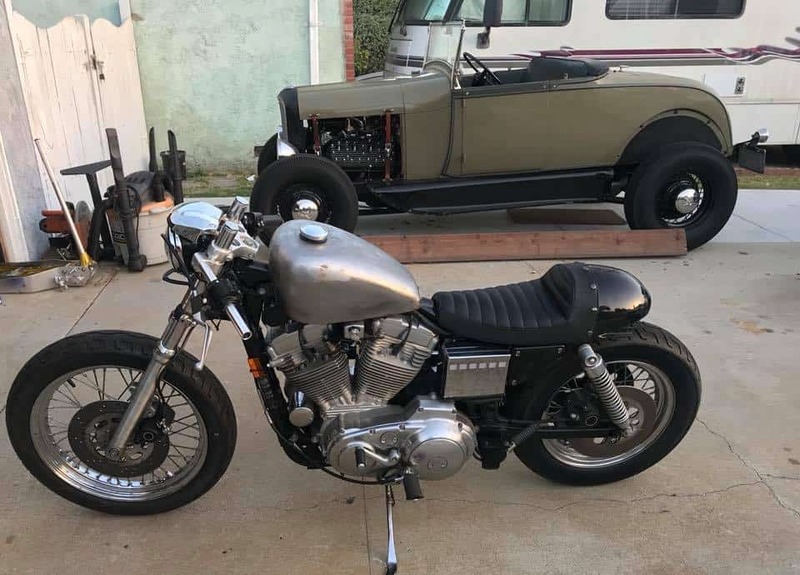 Jenn sat om it and likes the way it sits and feels, this was going to be her machine originally but I bought her a Bonneville instead. So, she is taking shape and wanted to share these progress photos I took with you on my Blog, this WILL be up for sale once it is completed and painted, so let me know if you are interested? It’s available as is for $4,800 with title right now, but the more I do, the more the price increases obviously. 714-598-8392 if you need to know more or carpy@carpyscaferacers.com you can even text me on the number too. 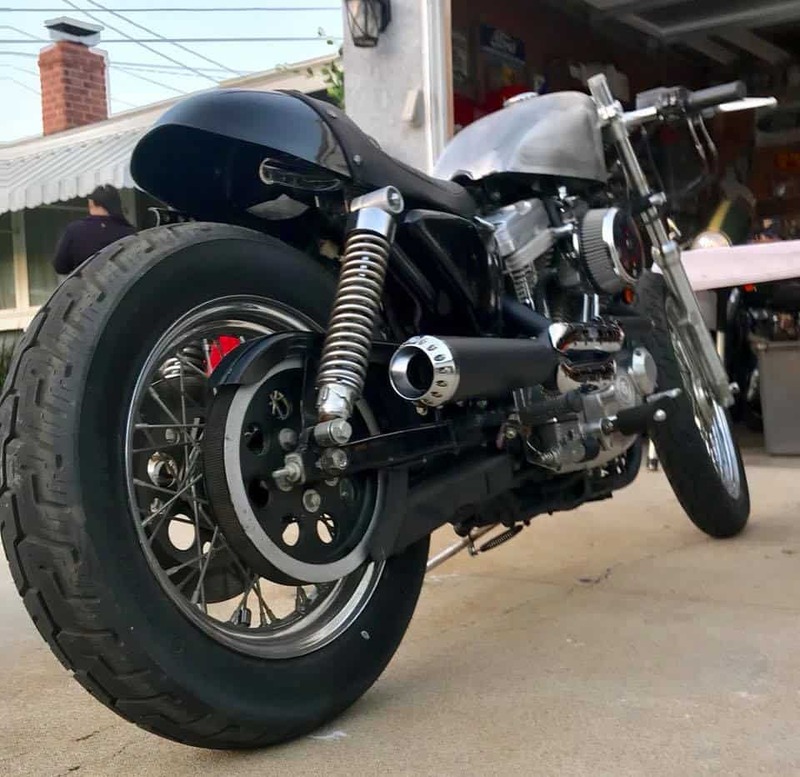 As you can see I have changed the rear shocks but I am going to be making some rear sets later on so you can have better leg room on the bike, but it is looking pretty good now and runs well. 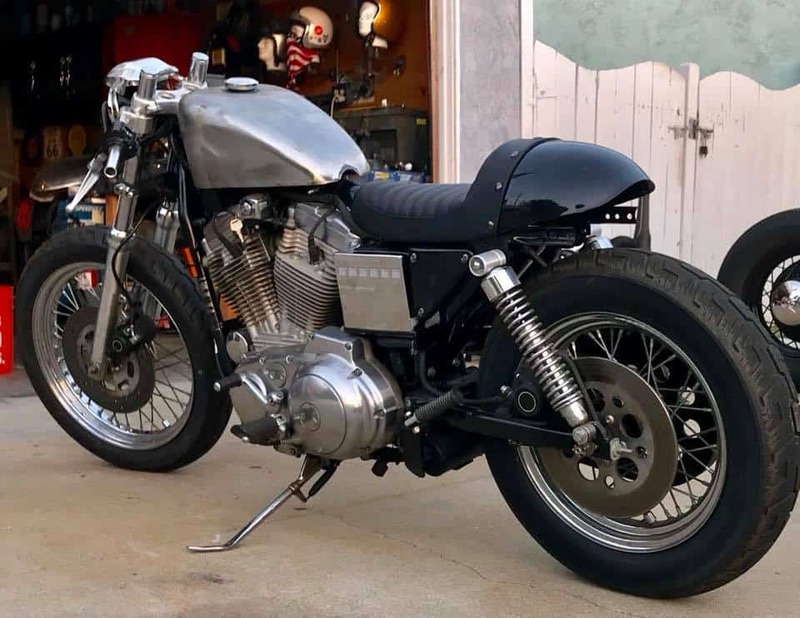 I will most probably Paint the gas tank and I am looking at frenching (Recessing) a Tear drop tail light assembly into the Seat Cowl for a more Custom Cafe look. Its a fun project and I shall post more pics in another Blog when I have finished some more of the work OK? Thanks for watching so far. I may fit a different headlight also, still having fun with this 5 speed Sporty and its starting to resemble something that I had envisioned from the start. 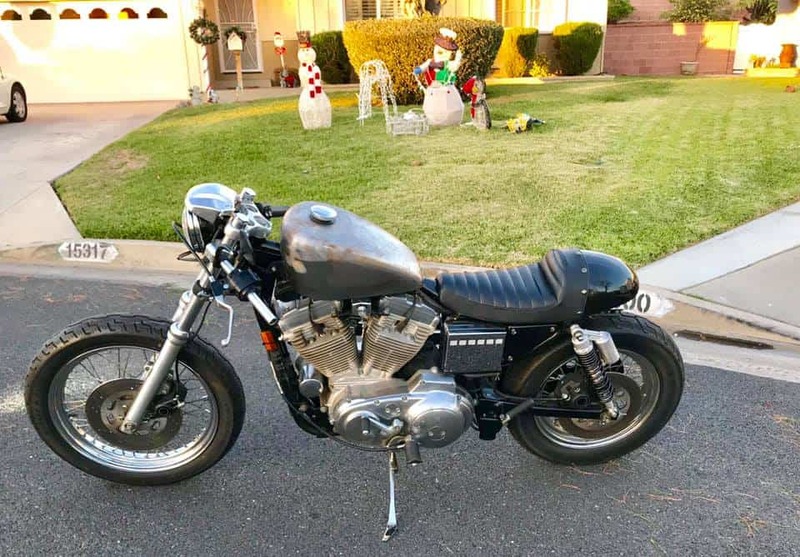 This entry was posted in Blog, Carpy’s Café Racers and tagged 5 speed, 883 sporty, American Iron, cafe racer, caff, For Sale, harley, sportster, ton up, Twin, Vee twin.